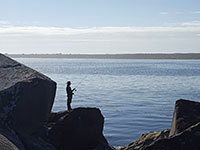 Some anglers are catching limits of rockfish and lingcod out of Newport and Depoe Bay; jetties and rocky coastline can be good for rockfish, greenling and lingcod, and the ocean surf off sandy beaches is the place to target surf perch. Fishing off the South Jetty in Newport. Photo by Cassie Whiteside. Check out these and other salty opportunities in the Marine Zone section of the Recreation Report. The whole family is welcome at a 5K that includes the change to try outdoor skills (archery, spin casting, wildlife ID) and see raptors up close at EE Wilson Wildlife Area. Register now. Fishing for bass, crappie and other warmwater fish, continues to improve in areas throughout the state. The Columbia River Subarea (Leadbetter Point, WA to Cape Falcon, OR) all-depth halibut fishery will be open for one additional day, this Saturday, June 17. See Marine Zone below for more halibut opportunities. ODFW is partnering with the Sandy Chapter of the NW Steelheaders to present a Steelhead 101 workshop on Saturday, June 24 at 9 a.m. at the Oxbow Regional Park near Troutdale. Find more information and register. Experienced hunters who take a new or lapsed person out hunting can enter to win prizes. Both must be adults (18 years and older). More info.